Theres this card called charged devilsaur, might have heard of it? weeeeeeell it's debatable whether Charged Devilsaur can be considered a charge minion in the sense this can. 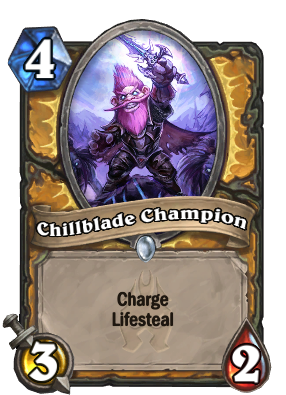 This is free to hit what it wants (as traditional chargers do) and if you go face you heal at least 6 HP most of the time, whereas Devilsaur can't attack face and as such can only be used as removal. I did some testing with this card in a handbuff deck on metastone and it was pretty good. I doubt it would see play in other archetypes though. It will probably be just a mediocre arena card. Nothing special. At 3/3 it would be busted lol. Earthen Ring Farseer that has the ability to heal you multiple times and the ability to heal you for more than 3 at a time if buffed. Sure it costs 1 mana more, but it seems like everyone is saying every card is bad in every set because they're understatted. When Paladin is the only class that can win a game against Mage because they just outheal all their burn, I'm sure people will be singing a different tune. But Earthen Ring is a neutral, and this is a class card. Of course has to be stronger. I consider it changed 3/3 to be viable in ranked, after all life steal approximately worth 0.5 mana. In most cases, this will be a 4-mana Bash. Not terrible in Arena, but in Ranked, look elsewhere. The low health makes this crap against aggro, and the low attack damage makes it crap as aggro. I don't see this card having any potential outside of a handbuff deck and there Wickerflame Burnbristle is much stickier and better vs aggro. The healing from lifesteal is dependant on damage dealt. It works just like [card]Wickerflame Burnbristle[/card] does. Unless there's a tribal buff for paladin, I don't think this is really worth it. It's essentially a card that says, "Deal 3 damage. Restore 3 health to your hero." (On one hand, this could survive after 1 turn or get a buff, but on the other hand, it may be unable to hit face when you really need to). I don't think that's really any better than Hammer, to be honest, or most of the cards pally is playing on turn 4. Feels slightly weak... I dont see this card being played. The paladin 4-slot is already heavy.